Every one of the previous Heller novels (from TRUE DETECTIVE through CHICAGO CONFIDENTIAL) will be reprinted in handsome, uniform trade paperback editions as well as e-books. CHICAGO LIGHTNING and the forthcoming TRIPLE PLAY are two new collections that take the place of (and expand upon) the previous Heller collections, DYING IN THE POSTWAR WORLD and KISSES OF DEATH. 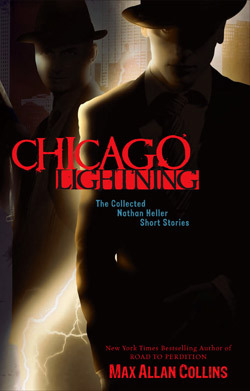 CHICAGO LIGHTNING is all the short stories thus far (including several never before collected) and TRIPLE PLAY will include the three Heller novellas-to-date (“Dying in the Postwar World,” “Kisses of Death,” and “Strike Zone”). Obviously I am thrilled to have Heller climb back into print, timed to support and cross-promote the new Heller novels from Forge. Mike Hammer remains very much in the public eye. An amusing review of KISS HER GOODBYE from AV Club is getting a lot of web distribution. Once again, the reviewer spends most of his time apologizing for liking the novel. But by the end he grudgingly, embarrassedly admits he did enjoy it (and bestows a B grade, not at all bad for the snarky AV Club). You may wish to read some of the comments, which are often hilarious in their idiocy (one guy doesn’t read my stuff because I look like a “nerd” in my author photos) and the knee-jerk political correctness rants that Spillane, even deceased, even in the 21st Century, can still inspire. Also, mention Spillane and “experts” will announce a predictable list of other hardboiled writers you should be reading instead. This web review of KISS HER GOODBYE is fun and right on the money. Worth checking out. So is this brief but lovely review of the audio, THE NEW ADVENTURES OF MIKE HAMMER: ENCORE FOR MURDER. Here’s a nice review of the new Criterion Blu-ray of KISS ME DEADLY. I have an advance copy and it’s a lovely package, and the film looks great. So, I say unblushingly, does my new updated cut of the documentary, MIKE HAMMER’S MICKEY SPILLANE, there as a bonus feature. I am grateful to Criterion for including it, because the sharp-looking booklet and some of the other features (notably the disappointing commentary) make the usual uniformed, sloppy, prejudiced comments about the original material. Constantly we’re told director Aldrich and screenwriter Bezzerides just “threw the novel away.” In fact, Bezzerides used Mickey’s basic plot, most of the characters (including their names), many memorable sequences (the opening of the film, for example, and the death of mobster Carl Evello) and even the fiery ending is a variation on Mickey’s. For Hollywood of the period, it’s quite faithful to its source, and evokes the surrealistic, fever-dream feel of early Hammer uncannily. Commentators continually talk about Hammer as if the books are predominantly about the P.I. taking on “Commies” (the only book of the first impactful six that does so is ONE LONELY NIGHT – a book in which SPOILER ALERT the bad guy turns out to be a thinly disguised Joe McCarthy). END SPOILER ALERT. Director Alex Cox has a piece where he’s enthusiastic about the film, but makes many dubious observations, including that Hammer is stupid in the novel and even more stupid in the film. At least Cox seems to have skimmed the book, which is more than most of the commentators have. Finally, I recently did a little project with my frequent collaborator, actor Mike Cornelison (Pat Chambers on THE LITTLE DEATH and ENCORE FOR MURDER, and narrator of my Spillane documentary). It was a competition to write and produce a short play in just under a week. I hope to have a You Tube link to the production, called “Alley Cats,” soon. The Judge’s Choice Award for night of competition, Friday, June 10, 2011. This award signifies that the three-judge panel found “Alley Cats” the best theatrical presentation among the nine shows presented that night. That which most represented the spirit of the 711 competition, created the most engaging theatrical experience and adhered most closely to the rules of the game. In addition, “Alley Cats” received the “Technical Excellence” award, which is voted by the technical staff of the 711 Project, and given to that production that shows the clearest vision, best use of lighting, sound and design and most concise and effective communication of their needs to the technical staff. “Team Caligula,” which presented “Alley Cats,” is made up of Max Allan Collins (playwright), Michael Cornelison (director/actor), Nick Cornelison (producer/actor) and Jared Hammer (actor). I hang my head in semi-shame. I STILL can’t find any of your new books anywhere. This only makes me want the new ones all the more. So if it comes down to ordering online, I guess I’m stuck. A week or so back, at the Printer’s Row LitFest, I found myself talking to a nice lady from Big Sleep Books in St. Louis, who told me at some distressing length about how midlist writers such as yourself are running into brick walls with distribution. She cited low print runs and reluctance to promote as the main problems. I nodded in sympathy, purchased Bob Randisi’s new Rat Pack book (which I also couldn’t find in any stores), and went home a broken (or at least a bent-out-of-shape) man. I did read that A/V Club thing you linked to above, and it was as silly as you said. However, I don’t get this ‘nerd’ business at all. I mean, I AM a nerd, lifelong and defiant (just see any of my recent comments at MYSTERY FILE about THE CASES OF EDDIE DRAKE for proof). I live alone, I’m overweight, I wear ties most of the time (not in the bath, though – and scarcely ever to bed), I still wear large framed glasses, and my hair has turned to silver (but I love it just the same). Compared to me, you and Barb are the King and Queen of Cool. Anyhow, just as soon as I get paid, I shall renew my eternal search for your new stuff. If you’re still afraid of the “nerd” tag you can always go back to using your bearded, longhair author photos from the mid 70s. Back then you looked ready to brawl with the first critic you could find. Wow, what a stunning bit of news. I can’t wait to buy them all! And I’ll finally be able to read NEON MIRAGE! It’s the only Nate Heller, other than the new books yet-to-be-released, that I have not read.